:: NikG* Life + Style ::: Flashback Friday Anyone? Since we happened to be on the subject of fitness and health in my last post, I thought I'd share with you all this picture one of my friends posted on Facebook of me when I was in my 8th month of pregnancy. I ADORE this picture because I think it epitomizes the tone of both of my pregnancies. I still always had lots of fun, and I was always very much active. I get a lot of props from people I know because of my "snap back" ability after having my kids. Most don't realize that I was very much in shape prior to getting pregnant, which makes it A LOT easier to get back down to where one would like to be, and also, I continued to workout and remain active for as long as I could through each pregnancy. It really is no magic secret to it! Anyway, hope you all have a slammin' weekend! Aww you look so cute in that pic!! So like thank you for breaking that down! In 07' I finally decided that hitting the gym hard had to be a part of my daily routine as well as a few other lifestyle changes and voila! Brianna came in 08'! yes you were all belly! so great to stay active. i'm very much inspired by you and hope to bounce back too! being tall helps too. this is a super sweet photo lady...have a great one! That's the best way of getting them out too! 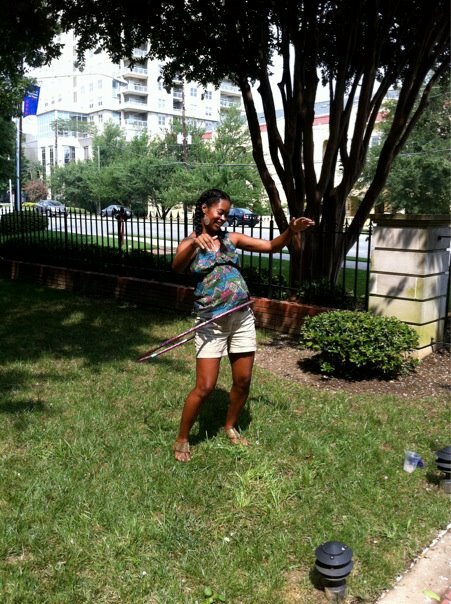 Staying active makes labor easy peasy! Beautiful pic of the boys!!! Sigh, lol. I love the revamp. I'm gonna revamp mine one.more.time. Damn my indecisiveness! Have a great weekend! You really do look great. I also worked out up until week 34 of my pregnancy, and I'm nursing, and I'm smaller now than I was before my daughter! Being in shape BEFORE and DURING your pregnancy really does make a difference!